I put "part 1" because, although I've worn this perfume over the past couple of days, I'm still not sure about it. The vine jasmine in the top pic, even I'll have to say doesn't smell all that great. It tends to be too sharp and thin. But the star jasmine (bottom pic) smells warmer, fuller, rounder, softer, and stronger. There's a fair amount of it here in public parks, street medians, and so forth. When it's in bloom, you can smell it from yards away...you can roll down your car window and breathe it in. I particularly liked that pic because of the sunlight...Jasmin Full has a sunny, rather than nocturnal, feel to it. 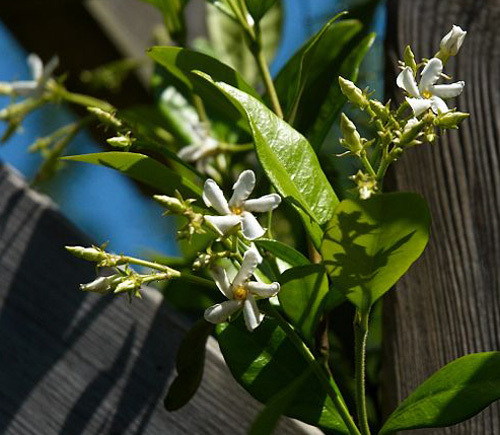 That said, Jasmin Full is not a literal copy of star jasmine. I get the same warm, sweet, round note, but there is more, a sort of drenching feeling...as if Montale had blended in some green jasmine leaves, and dashes of other white flowers. My sole issue with this scent is its sillage. It has the staying power; I can smell it on myself for hours and hours (not unlike their Aoud Roses Petals), but the sillage doesn't last very long, not even a good hour. Again, I put "part 1" because I don't know if I've just been chicken. Aoud Roses Petals was so potent, a couple of drops were good to go all day, so the first time I wore Jasmin Full, I didn't put much on. The second time, I put more, but of course I'm planning to put on even more today.